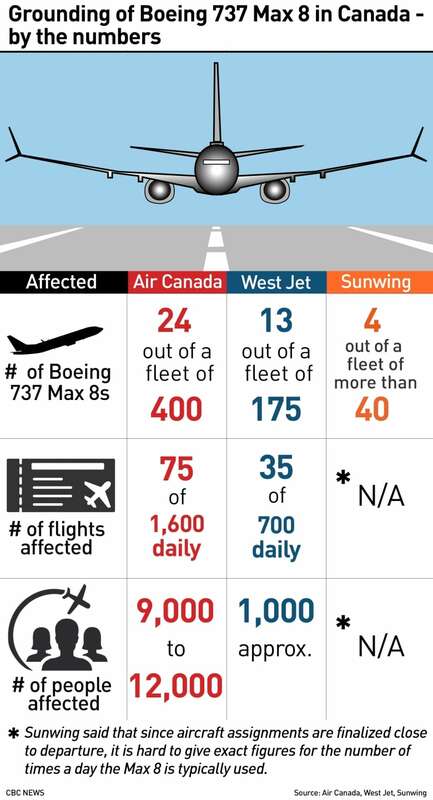 Transport Canada grounded all 737 Max jets from Canadian airspace on Wednesday, which threw a wrench into the travel plans for thousands of Canadians, and made a big dent in the route network at Canada’s two biggest carriers. Air Canada and WestJet collectively own dozens of the jets that they can’t currently use to fly their paying customers around. Air Canada spokesperson Angela Mah says the airline is working to “adjust our schedule with larger aircraft or additional flights where possible,” including using different aircraft to service destinations in Hawaii, California, Mexico and some parts of Canada. “We anticipated this possible outcome and have been working on contingency plans since the beginning of the week,” a letter signed by CEO CalinRovinescu addressed to the pilots and obtained by CBC News reads. The airline’s customer service hotline, where passengers could theoretically call to get assistance, doesn’t allow a caller to go on hold and merely refers them to the airline’s website. “Due to unforeseen circumstances our call volume has temporarily exceeded out capacity to put you on hold,” the message says. The airline still has 168 airworthy planes and is “working through the resulting cancellations which will continue to affect guest travel,” Stewart said. The following WestJet flights have been cancelled, as of Thursday afternoon. At Canada’s largest travel hub, Pearson airport in Toronto, there was little on Thursday to suggest any chaos behind the scenes. Keethan Krish, who was en route to Austin, Texas, said he checked ahead of time to make sure he was not booked on a Boeing 737 Max. Even once he confirmed his flight was fine, “I just took precautions to come here early, in case … things were hectic,” he said. Maninder Singh, the owner of InterSky travel agency in Montreal, says the Max 8 ban will cost him cash as he refunds money to passengers whose flights have been cancelled.